TGV (train à grande vitesse) are the high-speed trains that connect major cities in France at speeds of around 320km/h. Both iDTGV and Ouigo are a cheaper alternative to regular TGV trains, although the experience is very similar. Travelling on TGV train is fast. The record speed (achieved on a test track) is 574.8km/h. You can travel between Paris and Lille in one hour and two minutes and between Paris and Marseille in three hours and five minutes. A TGV train has run from Calais to Marseille in under 3.5 hours, covering a distance of 1067km (considerably farther than travelling between Melbourne and Sydney). In most instances a journey on a TGV train is easier and quicker than making the same trip by air. 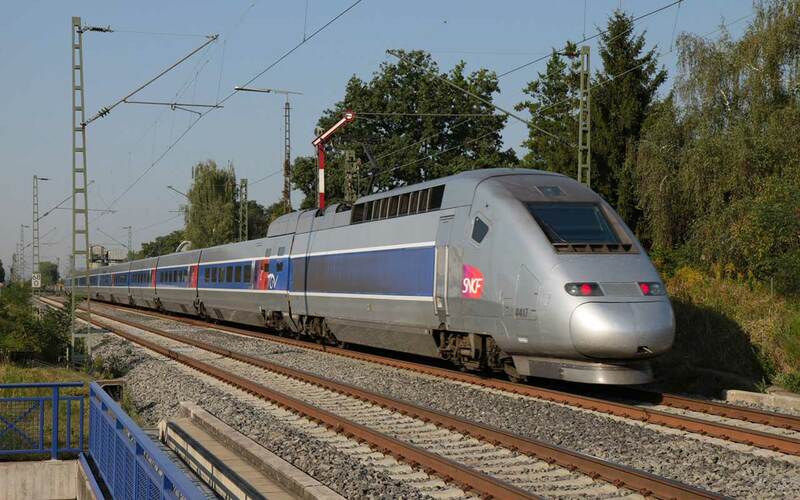 TGV are the most well-known French trains and are usually the main – and sometimes the only – route between cities that are served by a high-speed rail line. There are several different types of TGV trains, which include both the classic single level trains and the double-decker TGV Duplex trains. Services on board include a café-bar carriage where you can buy food and drinks (and metro tickets on TGV services to Paris). 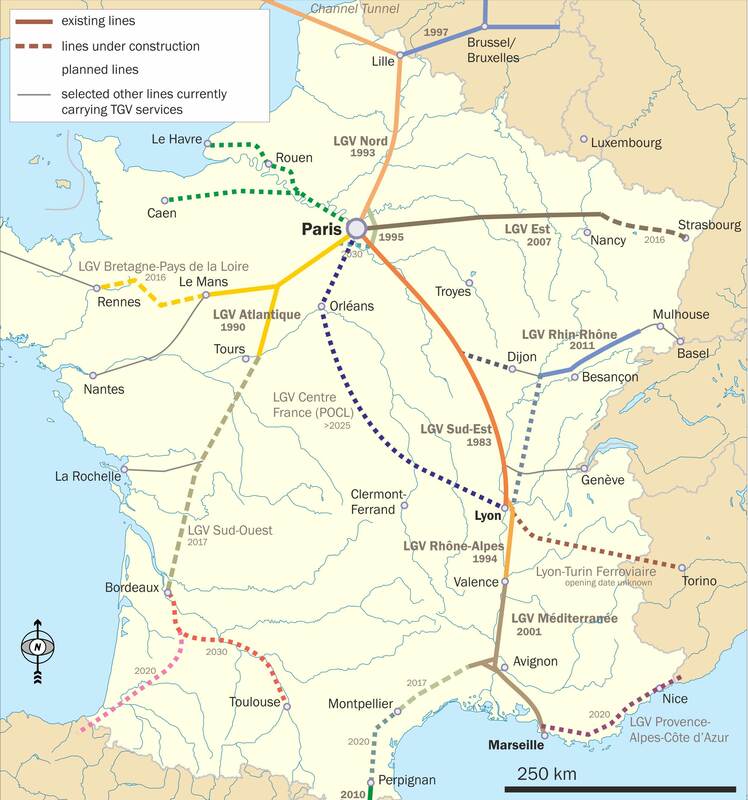 Although high-speed rail lines connect many of France’s largest cities, they don’t run everywhere. However high-speed trains are able to run to cities that are not served by high-speed rail lines (such as Bordeaux) although in these cases they run at a slower speed after they leave the dedicated high-speed rail line. The cheapest fares on classic TGV trains are the promotional Prem’s tariffs that can be booked up to 90 days in advance. These fares start at €15 (Paris–Lille) and are a good option if you don’t have a railpass and are organised enough to plan your itinerary months in advance. 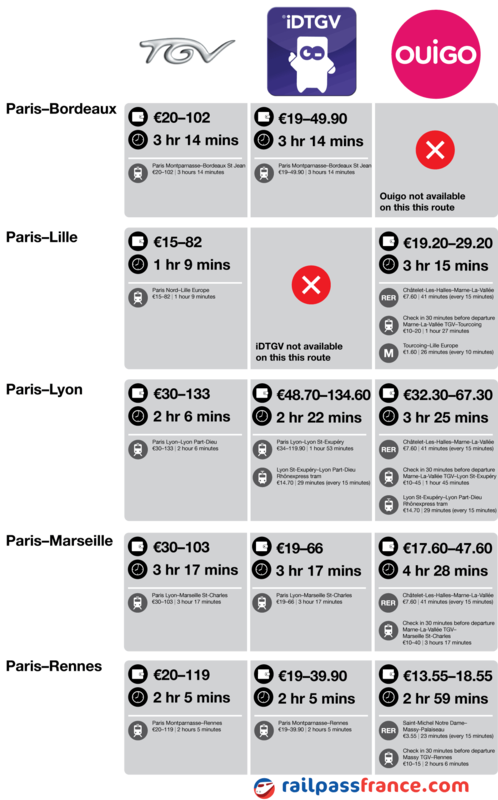 TGV Prem’s fares (booked in advance) are not that much more expensive than iDTGV or Ouigo trains, particularly when you take into account the cost and time involved in travelling to a less convenient station to catch your train when travelling on the low-cost alternatives. Leisure and weekend tariffs are a more flexible option than the Prem’s tariffs, but like Prem’s tickets are cheapest the further in advance that they are booked. The main disadvantage of travelling in France by TGV is the fact that seat reservations are compulsory. That’s not a big deal if you’re buying a ticket as you automatically reserve your seat when booking your ticket; however if you’re travelling with an InterRail or Eurail rail pass you need to pay a reservation fee in order to travel by TGV. Your seat reservation will cost between €9 and €18 for TGV travel within France, however seat reservations on some international routes can be as high as €60. 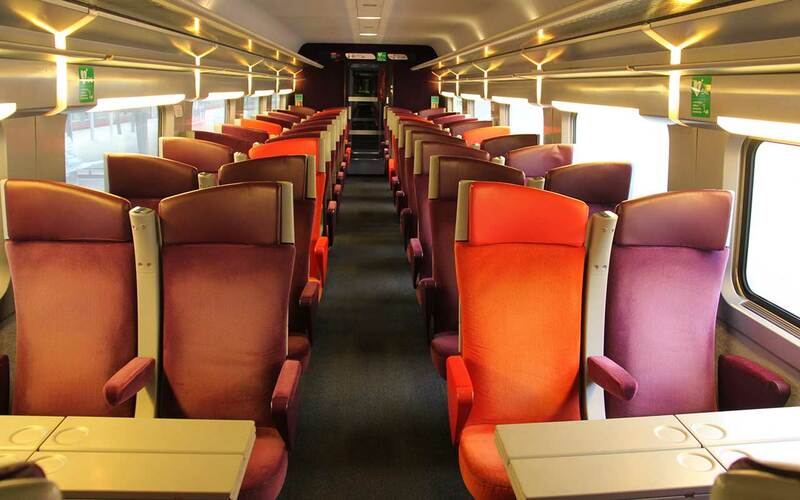 For TGV journeys in France there are a limited number of seats reserved for rail pass holders at the lower €9 seat reservation fee, once these seats have all been reserved you will be charged the higher €18 seat reservation fee. In some instances it can be cheaper to pay the full price for your ticket than to use your rail pass and pay the seat reservation fee. On some trains the number of people travelling by rail pass is limited, so you may need to make your seat reservation well in advance of your travel date spoiling the spontaneity that usually comes with travelling with a rail pass. The iDTGV is a cheaper alternative to the TGV that operates in a similar manner to low-cost airlines. Tickets can only be purchased online and iDTGV use a yield-management pricing structure (similar to budget airlines) where cheaper tickets are available to people who book their trip in advance with prices increasing after the cheap seats have been sold. Pricing on most routes starts at €19. Like regular TGV trains, iDTGV is available in both first and second-class seating. Furthermore, trains are divided into two carriage zones: iDzap and iDzen. iDzen is for travellers who want a quiet ambience (mobile phones and loud conversations are not allowed in the iDzen zones) and iDzap is suited for noisier travellers, catering more to families, groups of independent travellers and travellers who want to chat on their phones). Food trolley service is only available in the iDzap zone, although most iDTGV trains also have their own buffet carriage. The iDTGV network is centred on Paris and serves more than 50 destinations throughout France. If French trains were airlines, the regular TGV would be a full service airline like British Airways or Emirates, iDTGV would be one of the better low-cost airlines (like Germanwings or Vueling) and Ouigo would be Ryanair. Like iDTGV, Ouigo also operates a yield-management pricing structure but with prices starting at €10 on most routes. However Ouigo trains are single class with more seats per carriage so they carry around 20% more passengers than a standard TGV train. Also the average Ouigo train operates up to 13 hours per day while most TGV trains only operate seven hours per day so each train is used by more passengers before it is cleaned at the end of its shift. The major issue with Ouigo is that it operates from inconveniently-located stations on the outskirts of large cities rather than the main central stations used by most trains. Ouigo trains out of Paris, depart from Marne-la-Vallée (near Disneyland Paris) as well as Massy (in the southwestern suburbs of Paris). Some Ouigo trains also depart from Charles de Gaulle airport. Ouigo also use secondary stations in Lille (where they stop at Tourcoing) and Lyon (where they stop at Lyon Saint-Exupéry). If you’re planning on travelling on a Ouigo train you need to factor in the cost and time getting between these stations and the city centre. Most of these stations are well served by public transport, however transport between Lyon Saint-Exupéry station (near Lyon Airport) and Lyon city centre is by the expensive Rhônexpress airport tram that costs almost €15 (which often works out more expensive than your train ticket). If you’re taking a high-speed train in France you will have a choice between the regular TGV train plus the cheaper iDTGV and Ouigo trains. Because Ouigo – and in some instances, iDTGV – trains leave from inconveniently-located stations on the outskirts of town, choosing the best train for you is not simply a matter of picking the cheapest train. If you’re travelling to or from Lille, Lyon or Paris, the cheaper Ouigo train will depart from secondary stations in the suburbs, although Ouigo trains to other destinations depart from the main station used by other trains. If your trip is between two of these three cities (for instance Paris–Lille or Paris–Lyon) then your trip will be considerably longer as you will have to account for travel to and from these stations at both the beginning and end of your trip. 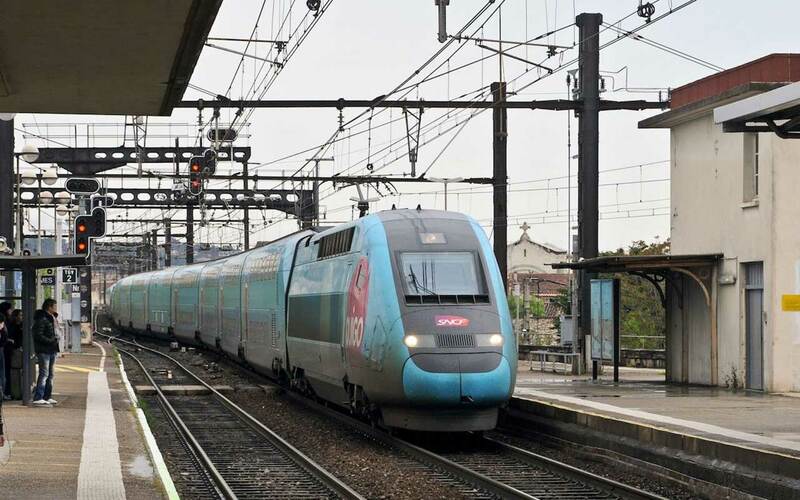 This can make the Paris–Lille trip take almost three-times as long on a Ouigo train compared with a standard TGV train, even though the main part of the journey is on a high-speed train running at around 300km/h. If you’re travelling between Paris and Lille it is worth checking if you can score a cheap advance purchase fare on a standard TGV train and only consider the Ouigo train if no cheap TGV tickets are available. In most instances public transport to these secondary stations are both cheap and frequent however transport between Lyon Saint-Exupéry station (near Lyon Airport) and Lyon’s city centre is a different story. Lyon Saint-Exupéry station is served by the expensive Rhônexpress airport tram service which costs €15.90 (€14.70 if you book online) so the trip to Lyon train station will cost quite a bit more than the €10 train to Paris. Because both iDTGV and Ouigo stop at Lyon Saint-Exupéry, your best option is to buy a ticket on the regular TGV service if you plan on travelling to or from Lyon. Apart from Lille, Lyon and Paris, most of the other stations on the Ouigo network are the main stations used by other trains. If you’re travelling from Lille or Paris to a station other than Lille or Paris then you only need to deal with a secondary station at one end of your journey so it isn’t such a big inconvenience to make the trek to a suburban station at one end of your journey, although making this trip at both ends of your journey is usually enough to make you consider paying a little more for a regular TGV train. With the exception of Lyon, iDTGV trains stop at the main station that is used by regular TGV trains. Apart from the lower price, the iDTGV is not that different to a regular TGV. It is always worth checking the regular TGV trains in addition to the cheaper iDTGV and Ouigo services as you can also score cheap advance purchase tickets on regular TGV trains. These won’t be as cheap as an advance purchase iDTGV or Ouigo ticket, although when you factor in the time and cost of getting to the suburban stations then it is often not that much more expensive to travel on a regular TGV train.